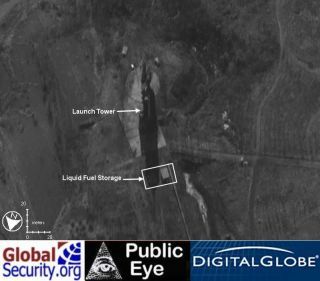 New imagery of the launch tower does not reveal a missile or space launch vehicle. Semi-buried liquid fuel storage buildings are visible. Sunday's failure of an improved version of the North KoreanTaepo-Dong-2 has deprived U.S. intelligence agencies from assessing performanceof the vehicle's third stage. This is deemed critical to determining theprecise threat the vehicle poses as an ICBM that could attack Alaska, Hawaii ordeeply into the continental U.S. Almost immaterial in the post-flight analysis is the failureof the vehicle to place a small communications satellite in low earthorbit, North Korea's stated intention. Unlike on the previous launches of earlier versions of the long-rangevehicle, the North Koreans announced the planned impact zones for the firstand second stages of the vehicle to warn ships and commercial aircraft out ofthe area. North Korea says the satellite launch mission succeeded, butthe U.S. says the vehicle failed about half way through an about 13-minuteascent. This plunged the second and third stages, along with the satellite intothe mid-Pacific Ocean. The vehicle was heavily redesigned after its 1998 initiallaunch failure that succeeded in sending the second stage over Japan. A redesigned version was launched in July 2006and this time failed early in first stage flight. The design was then changed againto the version launched Sunday, with liquid propellant first and second stagesand a long narrow solid propellant upper stage with a short bulbous satelliteshroud. A factor lost on virtually all news media commentators indescribing the vehicle following its launch is that the North Korean rocketflown is a three-stage, not a two-stage vehicle. The U.S. was able to monitor key phases of the countdownusing land, sea and air-based electronic intelligence assets. In the minutesprior to launch, the North Korean activation of its tracking radars was a tipoff that the launch was imminent. Following liftoff at 0230 GMT (10:30 p.m. EDT Saturday) thevehicle flew on essentially a 90.5-degree azimuth. The launch occurred at 11:30a.m. local time at the North Korean Musudan-ri launch on the northeast coast ofthe Korean peninsula. Radars in Japan and on U.S. and Japanese destroyers in theSea of Japan and the western Pacific detected the launch immediately as itoccurred as did two or three Defense Support Program (DSP) missile earlywarning spacecraft monitoring the Pacific region. The DSPs likely also detectedthe fiery reentry and breakup of the vehicle over the west-central Pacificseveral minutes later. The first stage burned as planned and fell into the Sea ofJapan 280 kilometers (173 miles) west of northern Japan. Japanese navy ships were pre positioned in the area andraced to the splashdown area with the hope of recovering debris for analysis. The second stage may have ignited, but analysts are stillassessing for how long it burned. If it did ignite, the second stage did notcomplete its firing. As a result the vehicle impacted 1,070 kilometers (664miles) in the Pacific off the east coast of Japan. This was several hundredmiles west and short of the area that North Korea announced where the secondstage and payload shroud debris would fall. U.S. intelligence agencies are closely assessing whether thefirst and second stages used an up-rated rocket engine compared with theprevious two launches. The third stage has not yet been tested in flight, a keyobjective for both North Korean success and U.S. analysis of the rocket'scapabilities. "Once they are successful with a third stage they wouldhave a missile that could reach the western U.S.," according to Rep. JaneHarmon (D-Calif.), chairwoman of the House Homeland Security Subcommittee OnIntelligence and Risk Assessment. "This is very serious and so it is criticalthat this administration play keen attention to this test activity," shesaid in a recent NBC interview. The solid propellant upper stage resembles that used on theU.S. Thor-Able rocket design flown in the early 1960s. The North Korean stage would have accelerated the payload to17,500 mph velocity for the orbital mission or a targeted slower velocitycutoff for ICBM missions to North America. Light-weight variations of the TD-2 with an advanced thirdstage could fly as far as 15,000 kilometers (9,315 miles) placing much of theU.S. at risk from a nuclear or biological attack if the North Koreans are ableto master the miniaturization of such weapons.